Founded in 1919 to become an "aviation port" and inaugurated in 1973, the Air and Space Paris Le Bourget Museum is one of the first aviation museums in the world with more than 350 "authentic" dream machines on display. 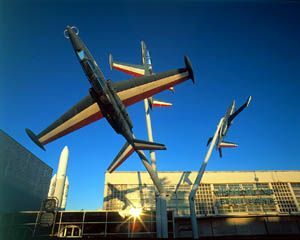 Witness to Man’s dream to conquer the skies, it is also the guardian of memory of the historical site it shelters: Paris-Le Bourget airport. 8 km to the north of Paris, over 18,000 m² of indoor exhibition space, it exhibits an exceptional collection covering all themes on air and space. Take advantage of the free access to the permanent exhibition or climb on bord the Concorde, a Boeing 747, the Super Frelon helicopter or an American war plane. The Museum features several halls retracing the epic tale of aerospace development. Climb on board the two legendary supersonic planes : the Concorde prototype and the Air France Sierra Delta. Admire the Boeing 747, Ariane 1 and Ariane 5. Discover this hall devoted entirely to space exploration ! Come and discover the restoration equipment and techniques of these mythical aircrafts that have made aviation's history. Discover behind the scenes of le Bourget airport dedicated to business travel and all our visits about aviation. Situated in the town of le Bourget, the museum is open all week except on Mondays, from 10 a.m. to 5 p.m. (until 6 p.m. from 05/01 to 10/31). It is also open on public holidays (except on January 1st, May 1st and December 25th). Permanent collections are always free except for special events, animation and visits of the two Concords, the Boeing 747 and the Dakota. You can choose between the several universes of the museum thanks to the numerous Passes part of the charged activities (planète pilote, simulation, plane visits, and planetarium). Guided tours of the Air and Space Museum are also available to groups. It is entirely possible to couple a guided visit of the museum with another visit at another site to follow a thematic tour. Consult our offer on guided visits for groups for more information.